An easiest way is let han shoot dengar first, if no then retry. 7* with G12 zBossk (251), G12 zBoba (217), G11 zGreedo (194), G11 Dengar (158), G11 IG-88 (164). Have lots of protection on Bossk and restart if Dengar doesn't stealth. I hit Chewie with Bossk's special, then Execute, then Greedo's TMR/stun. I went for ROLO, then Lando, then Han and R2. For the record, IG-88 died in the opening salvo. The whole point of this thread is discussing what works. If you don't want to see people talk about Bossk then maybe you should just avoid the thread altogether. Excellent work- very well done! I'm done, I'm not going to gear up a faction like that when I don't use BH in Arena (maybe down the road). I focused down Han first with Bossk’s all-in attack and then went for chewie. You need the thermal dets to stick. Used Bossk lead, boba, greedo, ig88 and zam. Took a few attempts but the first time bossk didn't get stunned on turn 1 I was able to net chewie and that led to a pretty quick execute. 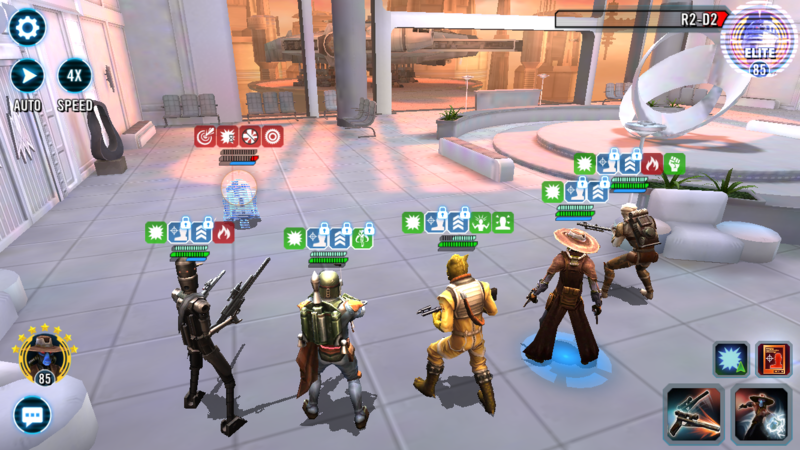 Lando and Rolo have very little health so they died during AOE (just kept them ability blocked with Boba). R2 was my next target because I needed to wait until Bossk's net was off cooldown for han. Took maybe 3 tries, didn't expect the community outrage on this one. Speeds: Bossk (238), Zam (235), Boba (217), Greedo (212), Dengar (186). I usually lose a character before I can even take a turn. I had to restart several times waiting for the right setup, which meant having Bossk take the first few hits so that IG-88 could survive and Dengar could stealth. My entire focus was on Chewie. I kept him stunned or slowed until I could get Bossk to net him and Boba to execute. At one point, he became the weakest enemy, which allowed our contracts to activate and he went down. After contracts were up and Chewie died, taking Guard buffs with him, I went after Leia, then Lando. Next was Han (I avoided him because I didn’t want a counter), and finally R2. It took several attempts and a lot of luck. G12 characters were no guarantee of anything. It’s not an easy win with Bossk, but it’s a possibility with the right RNG. It’s also possible for Bossk to die before taking a turn. You should be able to do it with that team. People have done it with less. Have you swapped mods around? Protection is very important. Losing one character shouldn't be a deal breaker, depending on who it is. I lost IG-88 right off the bat but still pulled out a win. You will need to swap in all of your best mods. 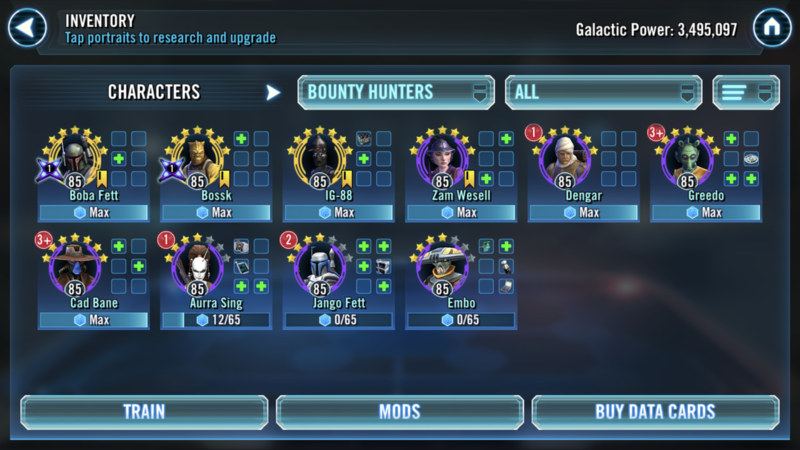 boba dengar and greedo g12+3 or g12+5? I did it with zzBossk (l) G12 Speed 263 / zBoba G12 Speed 239 / zGreedo G12 Speed 215 / Dengar G12 Speed 169 / Zam G11 Speed 223. Killed Chewie first, otherwise no chance at all. Kill him with Boba's Execution while he has offense up from Bossk's taunt. Then kill Han, Lando, Leia, R2. No casualties at this attempt (was maybe the 10th). I have played dozens of times and the closest I came was Han and Lando down with bounties activated and victory seeming imminent. Then Chewie remembered he was a vaunted Legendary cash cow and activated his auto-win algorithm. I was finally able to do it with this team after about 25 tries getting the right RNG at the start of the battle. Dengar got stealth and for some reason, still don't even know how, Chewie died super quick. After that I took down Han, Leia, Lando, and then R2. Boba died once but rezzed and that was all I lost. Everyone complaining: Just because Bossk is shiney and new doesnt mean he is best lead. I got 6* Chewie with undergeared team. Will probably work just as well for 7* with better gear. Zam or Boba need to be fastest. 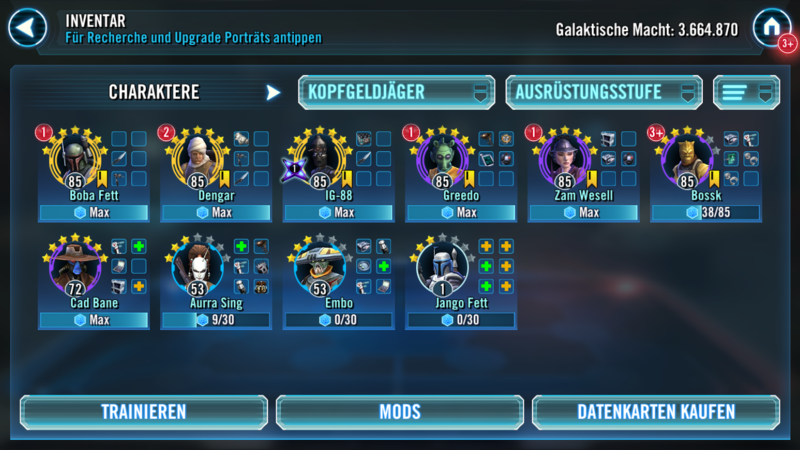 I got 6* with g9 Boba, Greedo, Zam, Dengar, and g11 6* Bossk. Had to move my arena mods but got 5* and 6* first time once I did. 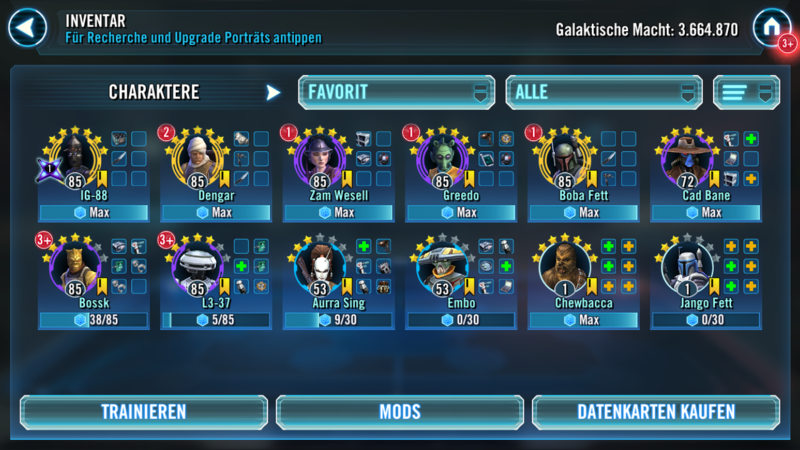 ZBossk(maxed, with all 12+ gear), ig88 (g12), bobba (g12), zGreedo (g11), dengar (g11). 1. Everyone should survive initial onslaught. 2. Han should attack dengar first. Not mine but here is one with only 1 G12 and 2 G9s and no Zetas.